You may include a couple of brief paragraphs about yourself and your work along with any contact info you want published: land address, web site, e-mail, and phone number are all appropriate (300 words +-). Text information should be placed in the body of your e-mail, no attachments please. Please note: Your text won’t be edited so please make sure it is as you want it. You may send 2 images to be posted to the VPS Gallery. One will be placed in the full-member gallery page and both will be placed in your own VPS page with your Art Statement. Images should be in jpg format and the resolution of 72 dpi (dots per inch). 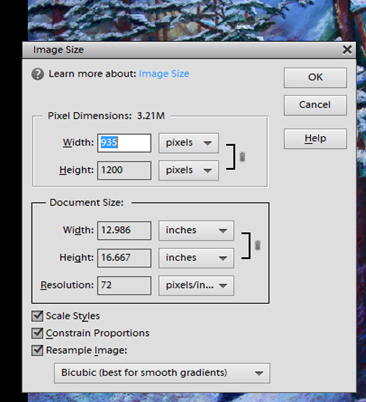 Also, the longest side of your image must not exceed 1200 pixels and your shortest side must be more than 800 pixels. It is important to get a good size image for the website; not too large and not too small. See below for an example of how to resize, and or go to the Education, Resource & Links page of the new VPS website for tips on how to resize. You must use the phrase ‘member gallery’ as the subject line of your email and send your request to cindy.griffith.vt@gmail.com. EXAMPLE of Resizing in Photoshop Elements. Above is an example of resizing in Photoshop Elements Software. The longest side of the image (height), height cannot exceed 1200. How to Plan a Workshop at VPS (Note: Those who plan a workshop, take the workshop for FREE)?